If you often go to a website that contains many fields or forms and do not want Dashlane to automatically fill these fields with your data, we added a feature to disable Dashlane on any page or site you want. Our impalas will never bother you again there. Note: This is for the browser extension in Chrome, Firefox, Edge, and Safari only. This feature is not yet available for Internet Explorer. However, if you disable a site on one of the other browsers, then it will be disabled on Internet Explorer too. If you encounter unexpected behaviour from Dashlane on a webpage or if you simply don’t want Dashlane to display the automatic fill menu with your personal data, you might want to disable Dashlane autofill either on one unique webpage or on an entire website. In the extension menu, click on the This website tab to access the Website Settings. Choose either This page only or This entire website. 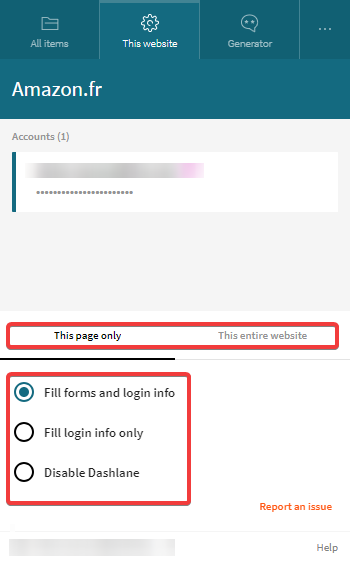 Choose the second option to only fill login information. If Dashlane autofill is disabled on an entire website, it will not be enabled on any webpage of this website. To re-enable autofill option, simply choose to Fill forms and login info. Remember to choose this option for both This page only or This entire website to get Dashlane to fill your personal data again.